Which Platform Should One Choose When Building an AR App? Which platform should you choose when building an augmented reality (AR) app? Before we start, perhaps, why should you care about AR in the first place—over something like virtual reality (VR), the other big word in alternate reality? The experience a quality VR system delivers is truly a new generation. Unfortunately, to run such a program, the hardware needed is, at this current state, still bulky and expensive. On the one hand, the headpiece component that a person would typically puts on still operates by means of a cumbersome wire that attaches to the hardware. The entire set to get things started will cost around $1,000 for the experience. The hardware technology still has some years of research before it can be cheap and efficient. AR, on the other hand, is able to create an effective experience using the most common hardware at this moment, a smartphone. There are more than 3 billion smartphones in the world right now. Including tablets, that’s a huge number of devices capable of supporting a functional AR experience. The standard program that comes to mind is Pokemon GO, the AR game that spread like wildfire during its launch in 2017. Seriously, college campuses finally look like the stock photos with people everywhere. AR has taken the form of very practical applications as well. An early experiment done by DHL Warehouse in 2014 used AR glasses for workers to increase efficiency by 25 percent (fewer mistakes, faster deliveries). Industries such as home remodeling, furniture, and retail could add a whole new layer to their sales processes with snazzy digital projection. Why buy the couch until you can see how it would look first? Maybe you walk into a store and see all the price tags and video clips floating next to the items. Many older industries—trades such as plumbers, carpenters, electricians, and technicians—would benefit greatly from the visual assistance with tasks, reducing training time and increasing efficiency. Hell, maybe that’s the tech allure needed to attract a younger workforce and market your business—walking onto job sites with Iron-Man visuals, pinpointing exactly what you need to do. Check out Magic Leap’s smart glasses demo to get a glimpse of how daily life can be changed drastically for the better. Of course, being a fan of the dystopian setting as well, check out https://www.youtube.com/embed/YJg02ivYzSs for the extreme version. 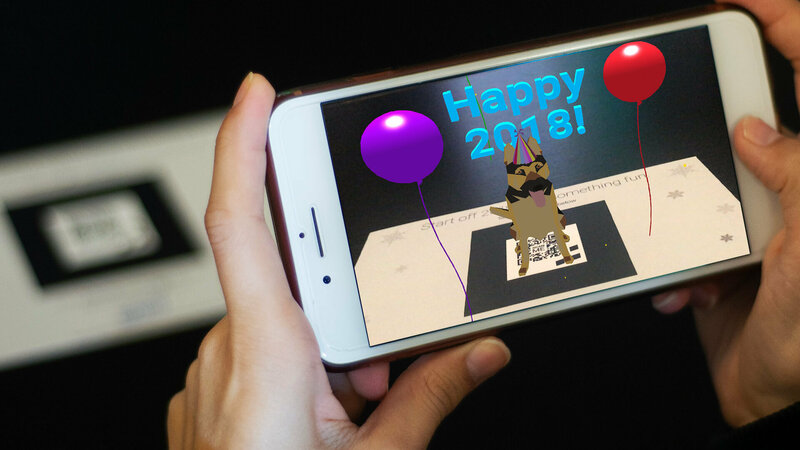 So by now, I hope you’re a little pumped about AR and want to incorporate it into your business strategy to provide your customers with an awesome experience. Let’s say you’re a candy company and you want live out your Willy Wonka fantasy by giving out prizes in the way of golden tickets—augmented tickets viewable when scanned through your application. Currently, there are three platforms on the market to get AR projects up and running. There is the web browser, full native app, and the in-between, a hybrid app. Let’s break down the pros and cons of each platform, starting with the old timer of the three, the browser. Then we have the powerhouse, the native application. The yang to web browser’s yin, native apps are able to run all the possibilities of AR: 1) simultaneous localization and mapping (SLAM), a feature that tracks objects and outdoor and indoor environments on which to attach AR projections; 2) geolocation, using GPS coordinates to attach AR projections; and 3) image recognition and tracking, in which instead of just recognizing basic markers, it recognizes items, faces, and any other image that is stored in the database to attach scenes to. These are the features that take AR to the next level. Here, we can get creative in how we want to deliver an experience. Want to have a projected billboard outside the movie theater? Virtual directions to where you need to go? Or how about a comic book that comes to life with an actual scene? The native platform would be able to deliver a high-performance application and really capture a user’s attention. However, there are, of course, a few cons with native development. For one, it is more difficult to develop, given the difficulty of the programming language, cost for developers, and approval process for the App Store. There is also the need to manage multiple code bases for each operating system—Android and Apple being the largest players. Ultimately, a native app offers the most power and ease of UX design when compared to the other two types, so if the focus is to create an intensive application that will be the face of user engagement, then it is the way to go, despite the higher cost in time and skill. But if some performance/complex features can be overlooked, and if the app is not the flagship of the company, then the hybrid app is the way to go for actually delivering a product within a speedy time frame and at a low cost. Web-based technology in AR is just not there yet at the moment, but it offers the most exciting possibility because most exposure for a company still happens on the web. According to a 2017 mobile web report, average monthly unique visitors are 2.2 times more likely to happen on the web than through app exposure. There are many people touting that the browser is the future, and there certainly are technologies pushing that dream forward—but not for another five years at least. For now, hybrid apps would be the quick fix for AR applications. As Joel Spolsky of Stack Overflow said, “A 50% good solution solves more problems and survives longer than a 99% solution that never gets out of the lab.” Questions to ask yourself: How important is performance to you? What is your budget? How frequently are you expecting users to use the app? I hope this article gets you thinking about the possibilities of AR and how it can revolutionize the way we live our lives.